It's easy to upload a resume in Teamable even if you don't want to share your networks. Q: I want to refer a candidate I know for an open position at my company. My HR department has asked me to use Teamable but I can't get past the screen where it's asking me to connect my social networks. I don't want to connect my social networks. Teamable will automatically match people you know to job openings at the company, even as new jobs are added to your company's website. Teamable will never out to anyone in your network. Teamable knows nothing about your online activities. All contact for the purposes of making a warm referral for a job opening is initiated and approved by you. You may be eligible for referral bonuses or other prizes at your company if someone you refer is hired. Still don't want to connect? Fine. 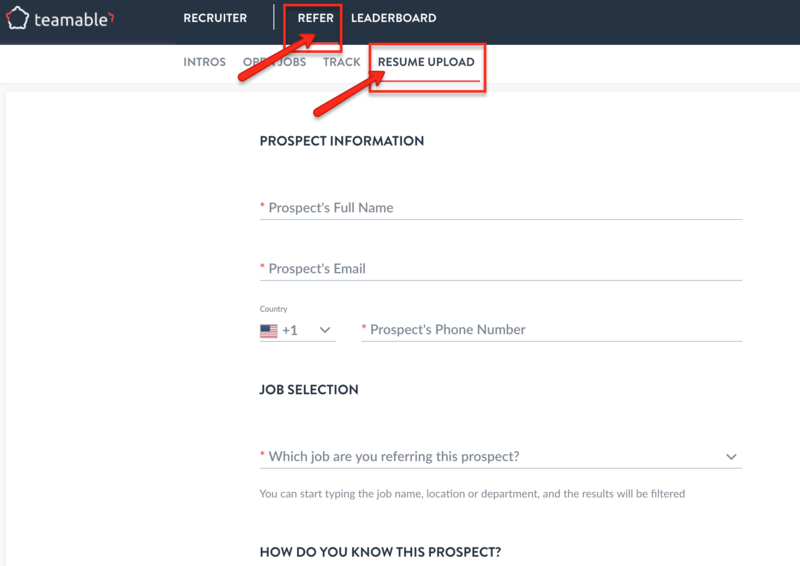 Just click on Refer>Resume Upload and enter the prospect's information.